This complete, interactive map of the West Bank and Gaza includes information about Palestinian communities and Israeli settlements, checkpoints, the separation barrier, agricultural gates in the separation barrier, settlement zones in East Jerusalem, etc. 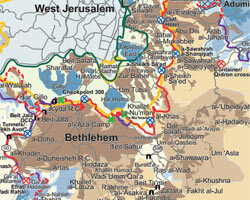 Plus ongoing B’Tselem reports and video clips, organized by location. 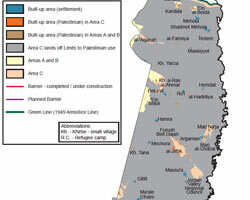 This comprehensive map depicts the updated route of the separation barrier, checkpoints, Palestinian localities, and settlements and settlement outposts in the West Bank.